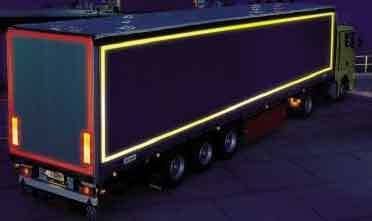 The ECE 104 is a new piece of legislation that introduces new guidelines for the use of high visibility reflective markings on long and heavy vehicles operating in the United Kingdom and throughout Europe. By 2011 it will be fully mandatory. This regulation primarily provides reccommendations for use of retro-reflective safety markings on specified vehicles. Already introduced in a number of EU countries it will become legislation in the UK in 2011.
Who and What does the ECE104 apply to? Full contour marking required. Red and yellow colors can be used. Conspicuity marking shall be as close as possible to the edge of the vehicle. 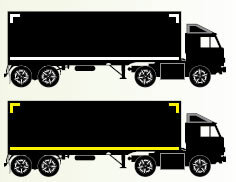 The cumulative length used should equate to at least 80% of the overall width of the vehicle. Full or partial contour marking required. Yellow and white colors can be used. Conspicuity markings shall be as close as possible to the edges of the vehicle and reach within 600mm of each end. The cumulative amount used should equate to at least 80% of the overall length of the vehicle (excluding the length of the cab for motor vehicles or the length of the drawbar for trailers). As low as possible, but within a minimum of not less than 250mm above the ground and a maximum not more than 1,500mm above the ground. Permitted where the shape, structure, design or operation requirements make it impossible to install the mandatory requirements.